Take a trip through the history of streetwear and street art with this exhibit featuring legendary artists from the South Bronx subway graffiti movement showing work on unconventional canvases. Reebok Classics, a brand born in 1983 during the same time that hip hop and graffiti shaped New York’s South Bronx culture are painted by 19 artists in the unique exhibit in Tampa only for a limited time. This exhibit opened at Burn Rubber Sneaker Boutique in Ybor City on July 27th but is now displayed at Mergeculture Gallery in Tampa Heights. The exhibit was remixed for the gallery and now displays more informative historical information which takes the viewer through a self-guided tour of influential graffiti that existed and still exists in the South Bronx. The remaining pieces in this collection are for sale. The exhibit features original canvases by Tkid-170, Part One, and Blade. Blade also has special limited edition books available through the gallery. 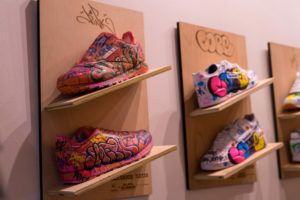 The remaining shoes on display are by Lady Pink, John “Crash” Matos, Cope2, and eight other contemporary artists. Contact the gallery for a special viewing of this exhibit at (813) 586-4765.